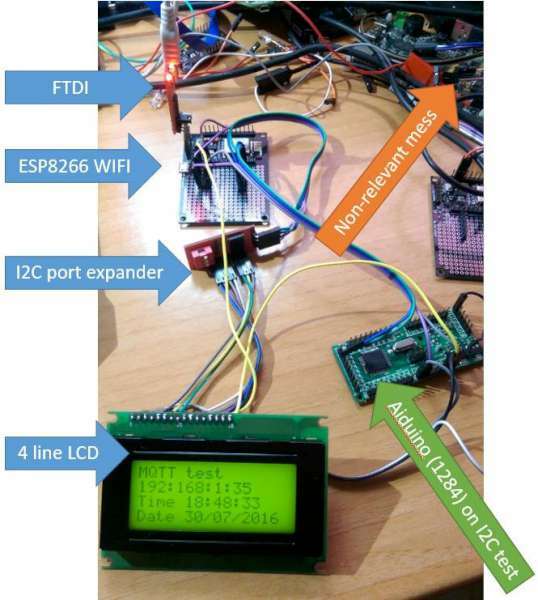 Success with I2c – once I realised there was something up at the Arduino end which I could work around, my ESP8266 I2c endeavours have been coming on in leaps and bounds! So what you’re looking at there from top to bottom – is a prototyping ESP8266 board (the author will recognise it) just because I had it handy – ESP-12 based, running my rapidly developing software (which now has loads of spare RAM thanks to the SDK 2.0). I put a simple set of i2c commands in there then promptly realised that a series of commands sent by MQTT would not be a lot of use. I then proceeded to waste the day, having already talked successfully to an 8-bit port expander, trying to get one of those back-of-an-LCD I2C boards to work – as it was based on the same chip. More details at Peter Scargill’s blog. This entry was posted on Tuesday, August 2nd, 2016 at 2:09 pm	and is filed under Arduino, wireless. You can follow any responses to this entry through the RSS 2.0 feed. You can skip to the end and leave a response. Pinging is currently not allowed.